Discover the benefit of booking on our website! Booking on our website you can book the promotion Stay 7 nights and Pay for 6 nights! Stay in an apartment and take advantage of the services of Palazzo San Lorenzo: concierge, breakfast buffet, restaurant "Sopra le Mura" and wellness centre "Spa San Lorenzo". 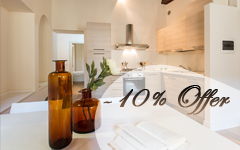 New, with nice furnishing spacious and bright holiday homes in Tuscany! Completely restored in April 2010, the apartments of Palazzo San Lorenzo are characterized by the sobriety in the furnishing and functional spaces. 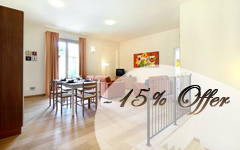 Bright and comfortable, are the perfect solution for those who prefer to stay in Tuscany in an accommodation like a holiday home, without forgetting all the possibilities and comfort offered by the town of Colle di Val D’Elsa. Immersed in a small little medieval village, everything is close at hand!